Estes Park, CO - New Way®'s Cobra Magnum can now be credited for more than its crushing power. Following heavy flooding that devastated the region, the company dispatched one of their signature refuse vehicles to Estes Park, Colo. to aid with clean up. 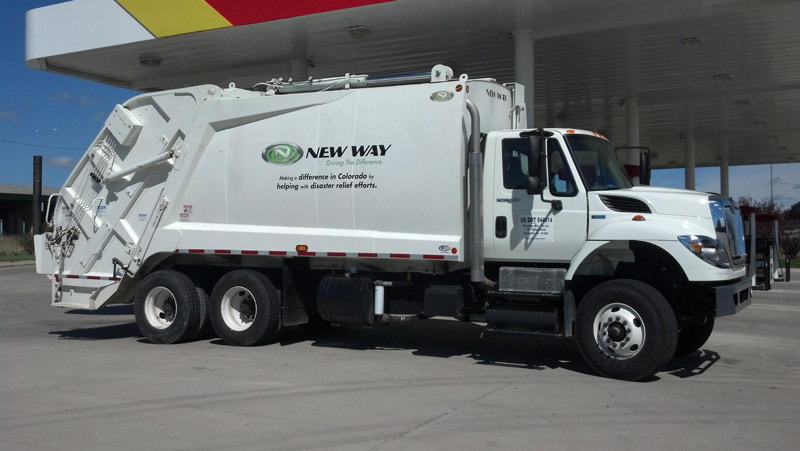 The powerful rear loading truck was driven to Colorado by staff from New Way® dealer Elliot Sanitation Equipment of Lincoln, Neb. and is being operated by employees of Gallego's Sanitation of Fort Collins, Colo. The September floods were the worst the Estes Park area has ever seen, with as much as 17 inches of rain falling in one day. The flooding killed eight people, destroyed approximately 2,000 homes and 200 businesses, damaged more than 16,000 homes and crippled 200 miles of state highways and 50 bridges. With the massive amount of damage the area sustained, clean-up efforts are ongoing. The New Way® Cobra Magnum continues to aid in the cleanup, doing its part to pick up demolished homes and debris. "These floods caused so much devastation to the area, it's hard to fathom," said Phil Allen, Executive VP of Sales for New Way®. "We are proud to be able to help and hope the aid of our truck will expedite cleanup so people in the region will be able to rebuild as soon as possible."